I had been longing for this beautiful vine, ever since the one I pruned - probably too much - 5 years ago did not survive. 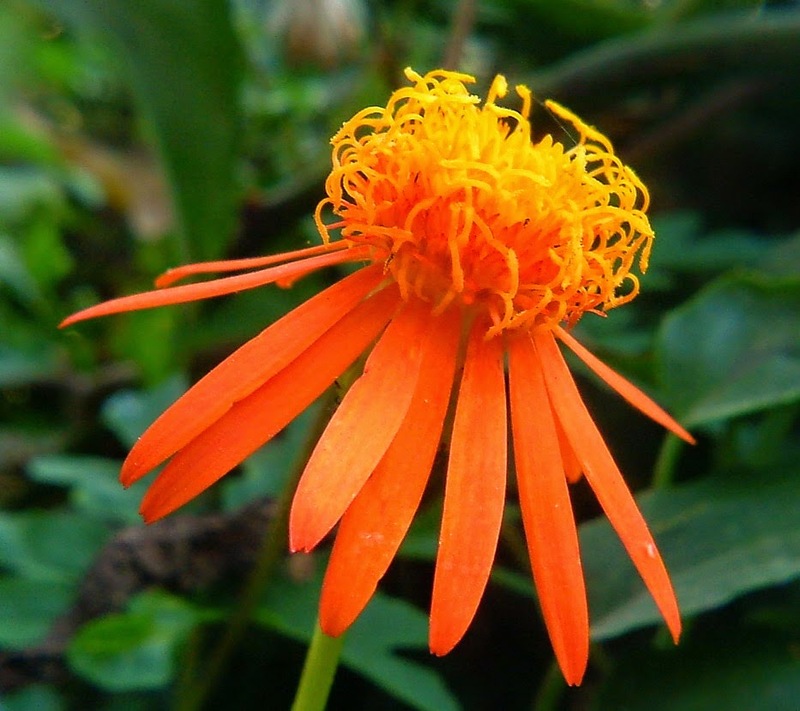 This is Senecio confusus, also known as Mexican Flame Vine and Orange Glow Vine. Picture from 2007 when it was in its full glory. Single flower from the cluster. 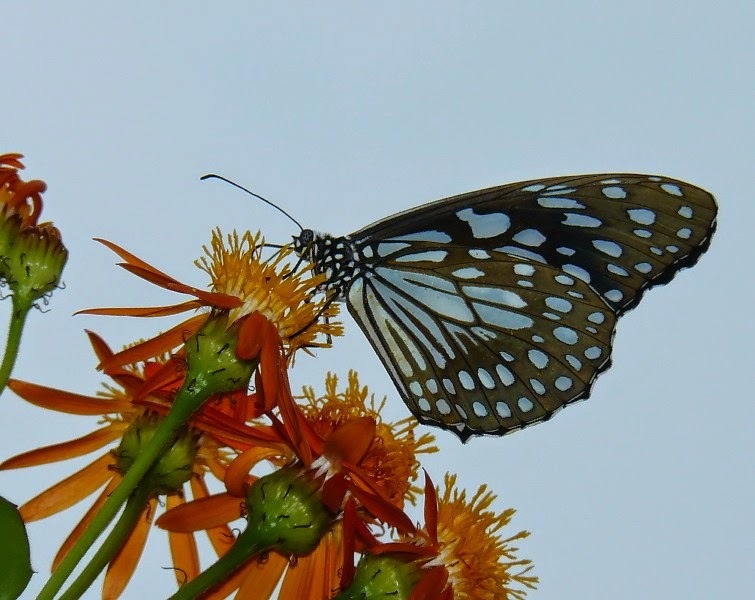 This is a favourite of the butterflies. Here is a Blue Tiger enjoying its nectar. 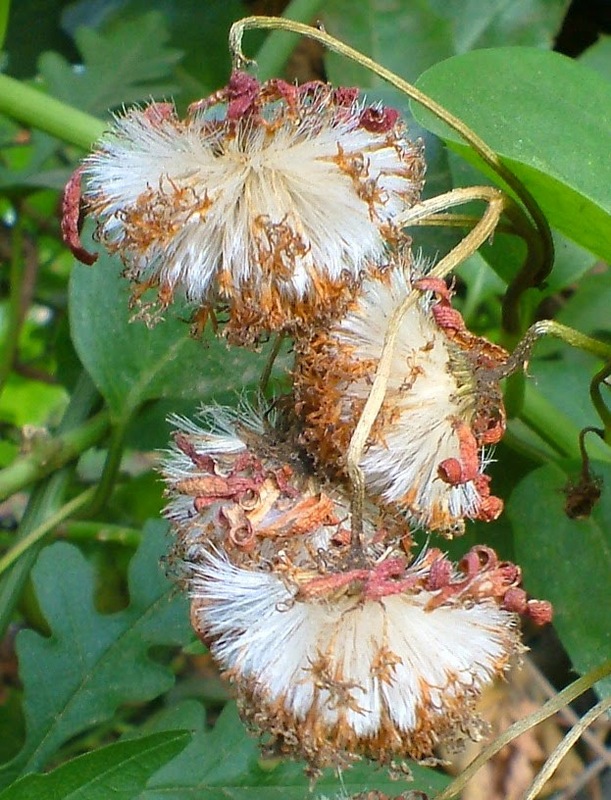 Seeds, but not known to be viable. Yet, my Mexico-living friend Bev has success in germinating seeds. I wonder is that why it is a 'Mexican Flame Vine'? She has sent me seeds from her vine for me to try half way round the earth. The first batch I sowed failed. I wanted to give it another try and waited for summer to end. Just as it ended and I was getting the garden bed ready, I got that mail from Bev about her web search for Jaquemontia she wants to grow. I have four of this blue vine of which I had sent photos to her. So that Bev mail triggered my search for the Senecio on the web since it was not available in local nurseries. This vine was sold some years ago and I saw this in many people's gardens too, but not now. I wondered how people can overlook such a fine vine that does not ask for too much attention either. I landed at one supplier in Bangalore who was ready to supply. I waited before confirming my order. I was off work and made use of this time to visit a nursery that I had not gone before, but had seen its presence in passing. So went there, skipping my post-lunch-holiday nap. It was Sampath Nursery on Bogadi Road. After going round the vast collection of plants, I picked up a few plants and then asked the owner "Do you have Senecio...." Before I completed, he completed the plant name "confusus, Senecio confusus, yes I have." I was delighted, both in finding my plant and also the knowledge of the man with plant names. He went a few steps and picked up one. I bought two. The man here is putting my plants in the cover I had carried. I bought Verbena [trailing], an Angelonia and one other which he named as Heliotrope, but it was not. But he admitted that he was not sure. I am still to find its name. The lone flower had fallen off during my scooter-transit of 7 kms. He is writing my bill. I had a place earmarked to grow Senecio near the wall. I had all hopes of finding it 3 months ago. I needed a small trellis for it to climb up the wall. The 'ladder' was ready - a part of a crude arch I had got made in 2006. I fastened a nylon net [an old piece from my cricket club net] to the 'ladder'. The next morning, I planted the new vine in the ground as soon as the support was ready. The other Senecio went for the arch near the pond. One side has Jaquemontia and the other has Morning Glory 'Grandpa Otts'. Since this MG is short lived, I will now grow the Senecio here and grow the MG anew in a pot. I sowed Zinnia and Cosmos seeds the next day once the Senecio was in place. They sprouted nicely on the 3rd day. Hopefully, the new season will have pleasing colours. Bev has already dispatched a packet of Zinnia singles which she grew from the ones I had sent her. So one portion of the bed is reserved for them -towards the far end of this bed. Updates will follow in the coming posts.